187 million daily active users (and counting!) are opening Snapchat 20 times a day to check out Snaps from friends, celebrities and brands. And while many still think of Snapchat as a platform for disappearing videos, you can also use it to create and share lasting content with Snapchat Memories. With this feature, you can explore a searchable history of your Snapchat posts, and archive awesome content to use again on Snapchat or another social platform. In this post, we’ll walk you through Snapchat Memories and the Flashback Memories feature, and share some tips for using this feature to build your brand and audience on Snapchat. 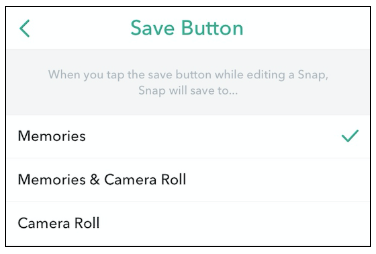 Snap Memories are Snaps and Stories that you can opt to save for later rather than allowing them to self-destruct. You can open Memories at any time to view, edit, send, or repost this saved content. Flashback Memories are like anniversaries for your Snap Memories. That means if you added a Snap to Memories on July 1, 2017, it will appear every July 1 as a Featured Story, prompting you to share it as a Flashback. They’re automatically generated, so you don’t need to do anything to get them—just check in on your Memories to see if you have a Flashback that day. Flashback Memories are pleasant reminders of content you were sharing in past years, and you might be surprised by what pops up! Unless you’re a robot, you probably can’t remember every cool video or funny photo you’ve posted, but Snapchat does. And like a trusty pal, they’re here to remind you of the good times. Snap Memories are automatically enabled in your account, which makes using this feature easy. To open Memories, swipe up from the camera screen. Individual saved Snaps will appear as rectangles, and saved Stories will appear in circles. Scroll through all your saved posts, or use the search feature to find specific Snaps. When you tap the search bar, you’ll see your Memories organized by categories and locations, allowing you to narrow down what you’re looking for. Snapchat also has a smart search filter, which allows you to search for keywords like “sunset” or “food” to find particular Snaps. 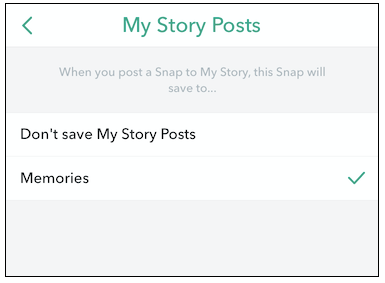 You can save Snaps to Memories before or after posting. 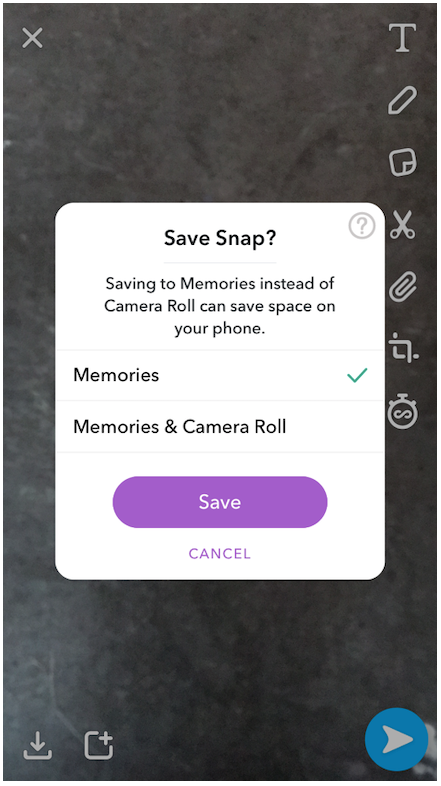 To save an individual Snap before posting, press the download button (in the bottom-left corner of the screen) to save it to Memories or your camera roll. To save a Snap or Story to Memories after its been posted, navigate to your Profile icon by tapping the top-left corner of the screen. 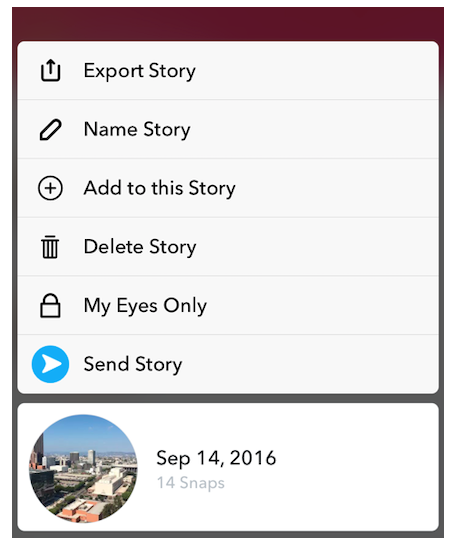 Press the download button next to the My Story icon to save the entire Story to your Memories. Or save individual Snaps by tapping the My Story icon. This will display all the Snaps within that Story. Tap on each Snap you want to save to expand it, and then tap the download button (now in the bottom-right corner of the screen) to add it to Memories. Keep posts that followers have sent you by saving them (or taking screenshots) and adding those to your Memories folder. You can also set up your account to automatically save all your content to Memories. Go to Settings, then Memories. You can also choose to save all content to your camera roll as well as Memories. This is a good idea for brands, especially if you plan to share Snapchat content to other platforms like Instagram or Twitter. It also serves as additional backup so you never have to worry about losing an amazing post. To save to your camera roll, tap the Save Button setting, and then select Memories & Camera Roll. To repost a Snap or Story, swipe up from the camera screen to see all your saved Memories. Tap on the Story or Snap you want to repost to open it, then hold your finger down on the screen to open up the menu. From there, you can select Send Snap to add it to your Story. You can also create a new Story entirely from Memories, recombining content from different days or Stories. This can be a fun way to create themed content, all featuring a particular product or type of post, or share a journey that lasts longer than 24 hours in a single Story. 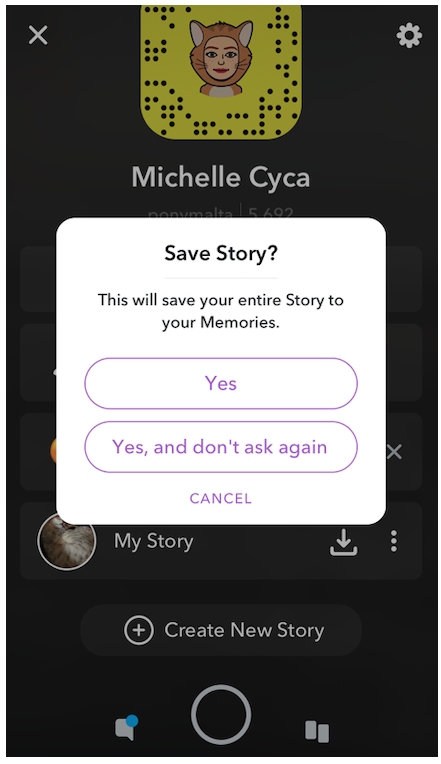 From the Memories screen, tap the checkmark icon in the top-right corner and then select the saved Snaps or Stories you want to share. Once you’ve selected all the posts you want to include, tap the circle with the plus sign at the bottom of the screen to generate a new Story. It will be saved in the Stories tab of your Memories screen, so you can find it (and add to it) later. From there, you can export this Story to save or post on other social platforms, or share it with your followers by tapping Send Story. If you want to save Memories but keep them hidden from your followers or friends, you can move them to My Eyes Only. This way, they won’t appear when you’re scrolling through your Memories screen. To move Memories, follow the same steps as above for posting Memories as a new Story: tap the checkmark icon and then select the Snaps you’d like to make private. Then tap the lock icon to add them to My Eyes Only. The first time you add a Snap to My Eyes Only, you’ll be prompted to create a four-digit passcode for security. You’ll be required to enter the passcode every time you open the My Eyes Only folder, which is accessible through the Memories screen. Make sure you choose something that you can remember (or write it down), because there’s no way to recover it! 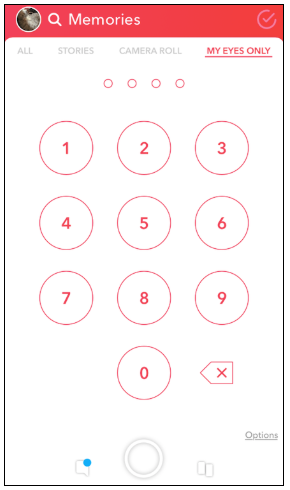 If you forget your passcode, those Memories will be gone for good. Snapchat takes secrets very seriously. You can always chose to make these Snaps and Stories public again. Just open them in My Eyes Only, hold your finger down on the screen, and select “Remove from My Eyes Only” when the option appears. Snapchat Memories allows you to share content created outside of the platform with your followers, by importing photos and videos from your camera roll. 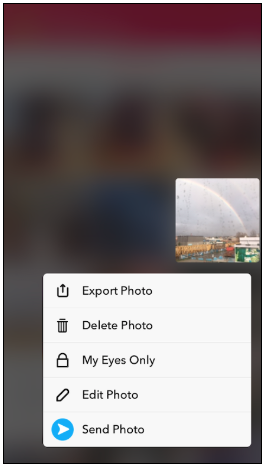 When you swipe up to open Memories, you’ll see a tab called “Camera Roll.” Tap and hold a photo or video you want to share, then tap “Send Photo” to add it to your Story. If you’ve created great posts for Instagram or another platform, this allows you to import them easily and share them with your Snapchat followers too. It can also help you build your audiences on other platforms. Snapchat Flashback Memories are available to you whenever you have a Memory on the current date from a previous year. Don’t see any Featured Stories? That just means you don’t have a Memory with an anniversary today. When you have a Flashback memory, you can edit, share or save it. Edit it to add new stickers, filters or other flair if you want to dress it up a little. After all, it’s an anniversary party. From there, you can tap Send Story to make it public, or tap Save to Stories if you don’t want to share it immediately. This will add it to your Stories tab and allow you to easily find and post it later on. Keep in mind that Flashback doesn’t apply to Snaps and Stories that you’ve made private by adding them to your My Eyes Only folder. If you’d like to disable this feature, you can turn it off in your Settings. But we think it’s pretty fun, and we’ve got a few ideas for putting it to use! Just browsing through your old posts in Memories might spark some new creative ideas for how to put those videos and photos to use. But we’ve also got some suggestions for how to use Memories and Flashback to grow and engage your audience. Flashback Memories are made for celebrations. After all, they’re anniversaries! Chances are, you’ll see Flashbacks that remind you of how far you’ve come as a brand. At some point, you might even see your first-ever post on Snapchat! Sharing those with your audience is a great way to acknowledge your long-time followers and show them how you’ve grown together. They also help connect new followers with your brand story, and provide the authenticity and behind-the-scenes intimacy that Snapchat users love. The 24-hour lifespan of a Snap used to mean that you could only tell one-day stories. Sharing details from a longer project, or photos from a multi-day trip, meant separate Stories that were disconnected and hard to follow. With Memories, you can pull together those posts and create a fresh new Story from them. If you’re about to release a new product, you can assemble a Story of all the work that led up to it. If you’re celebrating a team milestone, search your Memories for photos and videos of your team at work to share the story of your achievements. Because Memories lets you pull in content from your camera roll, you can even include posts from other social networks, or user-generated content that you’ve screen capped and saved. Recombining your content keeps it fresh, adds new context, and helps you tell deeper stories about your brand. Did you make a great holiday video two years ago? Maybe you’ve forgotten all about it, but Flashback will remind you. The date-specific feature is helpful because it works as a prompt; that means you’ll never miss the chance to repost an awesome Fourth of July video because you didn’t think of it until July 5. Sharing these posts again can help fill in gaps in your social media content calendar, and you can make them feel fresh with new stickers or filters. Do you use Snapchat to share discount codes with your followers? Memories can help you keep track of your promotional posts. Once you’ve put in the work to create those promotional Snaps, save them to Memories so you can share them again the next time you want to drive sales. Memories lets you easily export your content and upload to another platform. Unlike your camera roll, it’s organized by theme and easy to search, so you can use it like an archive of your posts. 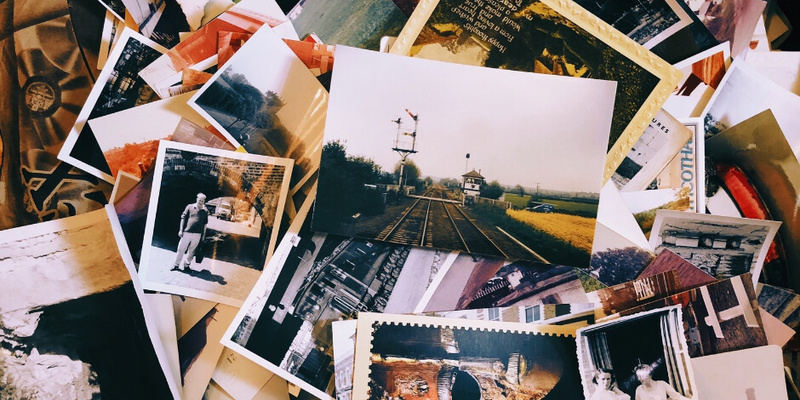 If you’re ever at a loss for what to share with your followers on Facebook or Instagram, your Memories will provide a treasure trove of ideas. It might even help you get more Snapchat followers. Videos and photos that got a lot of engagement on Snapchat are likely to perform well on other platforms too, so give them a chance to live out their full potential. Now that you’ve mastered this feature, you’re ready to reminisce with your Snapchat audience. Happy trails down Memories lane.